History: Catz was an immigrant from Israel. She came to the U.S when she was six-years old. She found success at the University of Pennsylvania Law School—she graduated with a J.D. From there she held many high-ranking positions with Donaldson, Lufkin & Jenrette, Hyperion, TechNet, and finally Oracle. In 2011 she became the company’s CFO and rose from there to become the co-CEO with Mark Hurd in 2014—becoming the highest-paid woman in business. She urges people to be courageous and flexible in their search for success. History: Meyrowitz graduated from Rider University in New Jersey with a bachelor’s degree in marketing and management. She found her home at TJX Companies in 1983 and hit her stride when she became the Executive Vice President in 2001. From there, she showcased her undeniable business talent and became CEO in 2007. While in that position, she led more than 3,300 retail stores—such as T.J. Maxx, Marshalls, and Homegoods—in six different countries. In 2016, she stepped down as CEO and has since served as the Executive Chairman. History: For her undergraduate career, Whitman thought she wanted to become a doctor, so she graduated from Princeton University with a Bachelor of Science. But she found her real passion at Harvard Business School. From there she worked most notably at The Walt Disney Company, and then eBay. She was the CEO of eBay for 10 years where she increased sales by $3 billion. 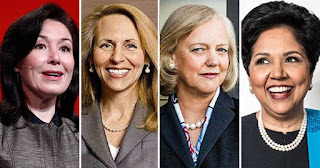 Afterward, she became the CEO of Hewlett-Packard from 2011 to 2015 and Hewlett Packard Enterprise until February 2018. She is now the CEO of NewTV, a mobile startup. History: Nooyi lived in Tamil Nadu, India, until 1980 when she was admitted to Yale’s School of Management where she earned a master’s degree in Public and Private Management. From there she held positions at Johnson & Johnson, Motorola, and more. Her career skyrocketed when she joined PepsiCo in 1994—she became the CFO in 2001 and the CEO in 2006. This is highly admirable since PepsiCo has only had five CEOs in their history, and the four others were men. She redirected PepsiCo into three different directions: “fun for you,” “better for you,” and “good for you.” In August of 2018, she stepped down as CEO and became a chairwoman for the company. She has helped PepsiCo’s sales grow by 80%.